AutoRunWizard.com - AutoRun Wizard FAQ - Can I force my autorun to open in Internet Explorer? Yes! 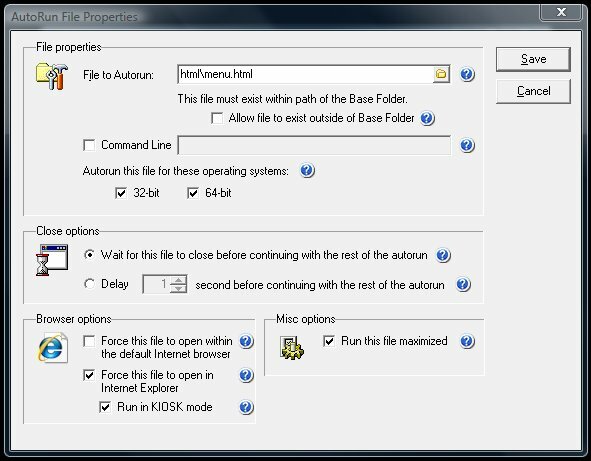 You can configure your AutoRun Wizard Project to force any/all of your autorun files to be opened within Microsoft Internet Explorer. Using this option is perfect for opening html, pdf, swf or any file type you want to open in the browser. Another feature with AutoRun Wizard is that you can specify to run Internet Explorer in Kiosk mode. When you run Internet Explorer in KIOSK mode, the Internet Explorer title bar, menus, toolbars, and status bar are not displayed and Internet Explorer runs in Full Screen mode. The Windows Taskbar is not displayed, but users can switch to other running programs by pressing ALT+TAB or CTRL+ALT+DEL. Because Internet Explorer is running in Full Screen mode, you cannot access the Windows Desktop until you quit Internet Explorer KIOSK mode by pressing ALT-F4 or include a button in your HTML that will close the browser. Go back to the FAQ for AutoRun Wizard. © Copyright 2019, AutoRunWizard.com by RJL Software, Inc.